I am not to sure about this card think there may be to much red....i await your comments...think i will do another????? I had the same problem this week, too much red or just too much on the card? I don;t think there's too much particularly, but, think it would work with less too"
It's great Sylvie and thanks for your kind words! 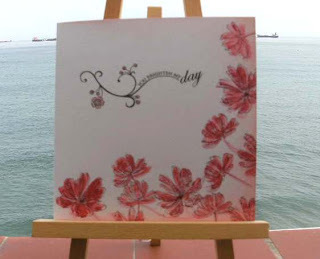 I would go along with Mandi.. and it would be great if the line of your stamped flowers could match the flow of the sentiment! It's a super card whatever! I think it's a lovely card Sylvie. Hi hunni I think ths is so very beautiful & I would certainly be proud of it hun it really is gorgeous. It's a beautiful card, so vivid. I think the flowers are rather lovely! I think perhaps a sentiment that is a little simpler would complement the flowers much more than a flourishing type of sentiment. I think the flowers are perfect the way they are though! Lovely card- I like the swirly sentiment. Gorgeous choice of placement for those beautiful flowers. Lovely card! This is beautiful sylvia, love everything about it! A very pretty card Sylvie. Really love this card, it is stunning. Lovely card Sylvie and definitely not too many flowers! Sylvie...I love the red blooms! A very pretty card! Sylvie, this is gorgeous! I love how you've used the Fast & Fabulous set - which is one I've tended to dismiss until I've seen your lovely card! That Hero Arts sentiment is so lovely too, think I might need to add that to my collection! Oh gorgeous! Love those red flowers which look very random but are beautifully placed! well I think it's a beaut! Oh wow! I really love those flowers! Is that just one stamp? Really beautiful take on the challenge! Well, I think that this is really, really lovely, so feminine, and, as it is not a strong red it doesn't give the idea that there is too much red. But I also do feel the sentiment should be lower, but what do I know. Hello Sylvia . The flowers are beautiful and just right for the challenge " less is More" RED. In my opinion I would have used a smaller sentiment but about same spot ..Hey love the backdrop to the card stunning view . Less is More 12 "Off Centre"